A good rider will be able to place the machine in the safest position on the road, relative to everything that is going on around them. The greater the speed, the more difficult it is to keep the bike in the safest position. Make sure that you can see as well as be seen. Think about where to place the bike on the road so that you can maintain your safety and allow others to see you at the earliest opportunity. 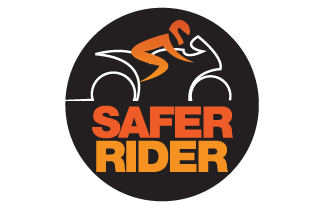 Some riders make the mistake of getting too close to the vehicle ahead, and the driver in front will lose sight of them. Drop back and give the driver ahead the opportunity to find you in their mirrors. This also increases your safety margins. Getting too close means you will react to the brake lights in front rather than responding to what you can see further ahead. By building space around you, you will not only improve your safety but your ability to plan and make smoother progress. Creating space may require a little thought and knowledge, but it can make a real difference to your safety and overall enjoyment. Overtaking is regarded as one of the most hazardous manoeuvres for a rider, but often it is not planned well enough to ensure maximum safety. When you commit to an overtake you are making a decision to pass the vehicle(s) ahead. In order to get there safely, consider the points below which should make the planning easier. It is important to make your choice to overtake at the safest and earliest opportunity. To do this you need to anticipate where an opportunity is likely to present itself and prepare the motorcycle so that you are in the right position with the correct speed and gear selected to commit at the right time. Prepare the motorcycle so that you are close enough to make the overtake at the earliest moment, but not too close to the vehicle in front. Make sure that you have the appropriate gear engaged that will allow you the maximum acceleration if required. When you do apply acceleration, deliver the power smoothly to help maintain the stability of the motorcycle when completing the manoeuvre. Most modern motorcycles have outstanding performance; even some of the smaller bikes have excellent acceleration. Riders often make the mistake of getting too close to the vehicle in front, which closes down available views. So stay back where you can see. Look at the vehicle and consider its performance against that of your motorcycle, bearing in mind that most family saloons these days have surprisingly good acceleration, but not as good as most motorcycles. If the available road looks a little short then just don’t risk it. Make a sound judgement about whether you have enough available room, if in doubt do not do it. A safer opportunity will present itself. Again, think about the performance of most modern cars. The speed of oncoming traffic can be difficult to assess accurately at times, so if in doubt stay back and wait for the next opportunity. This is more tricky. So many riders look at the road ahead and if its clear they do not consider the fast oncoming car just around the corner. ALWAYS assume that there is one just out of your view and consider then if the available road is sufficient to make the manoeuvre safely. As riders we are perhaps more aware of the changes of road surface, than any other group of road users. The importance of finding the safest riding line and one that gives the maximum road holding and braking capabilities is vitally important to our safety. But have you ever wondered what is actually running beneath the tyres and just how much grip is available? This page provides an introduction to what is involved and things that you should be aware of when out riding. On roads with a good clean driving surface there will be a high skid resistance although this can change with the weather and other factors during the life span of the road surface itself. Roads are built up through many layers until we finally reach the top dressing, the one that we ride over. This is generally Bitumen based into which is rolled an aggregate (chippings). The aggregate provides the sliding resistance between the road and the tyre. The aggregate undergoes testing to determine the level of skid resistance. There are agreed minimum standards that determine which aggregates are used and where. As new surfaces are laid down the size and quantity of the aggregate are measured and tested to ensure that the gap between the chippings is to a minimum standard as is the height that they protrude above the bitumen surface. The surface of the chippings is called the microtexture. It is the main contributor to skid resistance and the dominant factor in determining skid resistance in wet conditions. The macrotexture is essentially the gap between the chippings and serves to drain water away form the road surface. A skid occurs where one or more of the tyres loses normal grip on the road. This happens when the grip of the tyres on the road becomes less than the force or forces acting on the vehicle. The skidding resistance on a wet road is reduced by the film of water acting as a lubricant on the surface. The relationship between the aggregate, its surface and its contact with the tyre are important in dispersing water and become increasingly important as the speeds get higher. The surface of the aggregate (Microtexture) can only penetrate the remaining water film if the chippings are sharp enough to build up a “dry” contact with the tyre. As roads are travelled there is a polishing effect on the chippings and over time the Microtexture wears down so reducing its effectiveness to skid resistance. Sideways forces acting between the road and the tyre allow the bike to travel through the curve. The increased amount of skidding resistance is determined by the speed of the vehicle and the severity of the curve. So at locations where there is a high level of acceleration, braking and cornering, the polishing effect on the aggregate is at its highest and so skid resistance reduces. You might think that when a new road surface is laid down that the skid resistance is at its most efficient. However, like a new bike tyre, the surface has to bed in and wear away a little to reveal the true surface. As road surfaces are laid down the aggregate is immersed in bitumen and rolled out so that the effective surface of the chippings is not revealed and needs to be worn away though the action of traffic passing over its surface. This allows the bitumen over the chippings to oxidise and break down to reveal the rough area that effectively provides the grip. “Slippery Road” signs will often appear at these sites and will remain for some months until the road has matured before being taken away. Do not assume that after a couple of weeks that all is well, caution still needs to be applied. So those riders that like to ride fast and exert a lot of force through the tyres when cornering should consider that over new surfaces they could be facing a reduced level of skid resistance and the need to slow down becomes a real MUST. This equally applies to well worn surfaces where the polishing effect has also reduced the skid resistance of the road surface. There are many factors, including the weather, traffic flow and spillages to contend with, that can change the characteristics of the road surface. Winter Roads remain wetter for longer during the winter months between October and March. The grit and dirt washed onto the road works in with the road surface making it harsh and so improves the grip available. Summer, the roads are a lot drier and the debris is very dusty and assists in the polishing of the road surface and so effectively reduces the level of skid resistance available. Therefore during the very months that most riders are out enjoying the bike, the roads offer a lesser degree of skid resistance than in the winter months. So next time you’re out there look for the signs and understand what they mean and the information that they provide to you as a rider. Don’t take the road surface for granted. To really enjoy your riding you need to get your cornering right. Next to overtaking this is the one discipline that so many riders get wrong. Get it wrong and at best you will end up exploring the wildlife in the hedgerows, at worst you may not live to explore anything ever again. In many cases the rider carries too much speed into the curve only to find that it is very difficult to slow down once committed to taking the bend. You need to slow things down in order to get the framework in place to develop this very important skill. How many times out of 10 do you negotiate a bend and feel uncomfortable on the approach or during the exit from it? Look ahead, as far you can see. Follow the line of the road ahead and then look to both sides of the road. The hedgerows and tree lines will often provide clues as to where the road is going and help to assess the severity of the curve. Look for available cross views to link in with what is immediately available to your view. Start fitting the various pieces of the puzzle together. Don’t forget to look behind, using your mirrors. Find a good bend, it doesn’t matter if it is to the right or to the left, and look for the point where the two verges appear to meet. This is the vanishing, or limit point. If you enter a curve and you seem to be catching up to this point then you are travelling too fast. If your speed leaves you feeling that you are remaining the same distance from the vanishing point then you are at the right speed for the curve. Always lose your speed on the approach and build time into the process. Practise this discipline until you have perfected the technique, and this can only be done at speeds you can manage, so keep a large safety margin in the early stages of development. Excess speed isn’t just about breaking the speed limit. Excess speed is when you are travelling too fast for a manoeuvre. It can be as little as 2mph, because too fast is too fast. The stability of the motorcycle through a corner will depend very much on the correct choice of gear. You need to choose a gear that will maintain the balance of the motorcycle and deliver the right amount of flexibility to accelerate or decelerate with accurate use of the throttle. Listen to and feel the engine respond to the chosen gear. Is it straining or laboring in the current gear? If so, change it. Very often, changing down just one gear will instantly improve the stability of the motorcycle. Keep it smooth because acceleration alters the distribution of weight between the wheels of the motorcycle. Look to the exit of the bend and apply the right amount of acceleration as the view opens. The lines to be adopted along either a nearside or offside bend are well documented in Roadcraft (available from book shops, ISBN: 011341143X) as are the advantages of an earlier view and improved safety margins. By adopting the correct line for the bend, the motorcycle will be travelling towards the crown of the road on the exit side, rather than towards the road edge, which is what happens when a more shallow line is adopted. If cornering still presents a problem for you, then consider a short period of training. A small input can offer dramatic improvements to your skills. There is no need to keep getting into problems. Talk to your trainer and get them to explain the principles. Don’t be shy – we’ve all had to do it. If you haven’t taken your bike out over the winter months, hopefully your bike won’t be rusty, but you might be, after a long break from riding. Top riders strive to improve their performance through education and training all year round. But many, more casual riders will dust their bikes off after several months in the garage, expecting to carry on exactly where they left off. As you check the bike over to make sure it is in top condition to ride, stop and think about whether you need an overhaul as well. How many near misses did you have last season? How many bends felt wrong as you were going through them? How many overtakes did you make when you were suddenly confronted by an oncoming car that wasn’t there when you started? When was the last time you seriously considered your riding skills? What are you going to do to prevent a collision this season? Consider your loved ones and the genuine concern they may feel every time you take your bike out.